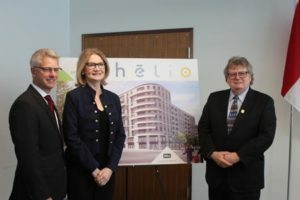 The federal government is investing $3.9 million in Canada’s first mixed-use, multi-unit residential high-rise building targeting net-zero energy. Canada’s first mixed-use, multi-unit residential high-rise, net-zero energy building will rise up in London, Ont. The federal government is investing $3.9 million in the project. The building aims to demonstrate the feasibility of net-zero energy at a community level, and inspire change across Canada’s construction industry, as part of the government’s efforts to use renewable energy technologies towards global climate change goals. Funded through Natural Resources Canada’s (NRCan’s) Energy Innovation Program, Sifton Property’s Helio building will include a monitoring system that will be used to optimize energy-efficient performance.